The Vale posts are always hard to write but especially so this time. My wonderful BeeGee was euthanased on Monday morning. She had been making so much progress. We had got both the infections under control and in fact her ear infection was completely gone when the vet checked it Monday. But on Sunday she began to go backwards as far as progress. It became clear that the infection had spread to the one place we had no chance of fixing it, her brain. For the past two weeks BeeGee was the center of our world. Looking after her took the number one place on our to-do list. We became masters of finding a solution to whatever problem was happening at that moment. The Other Half built a Raspberry Pi thing to do the camera stuff we needed, so we could have an eye on her without having to disturb her rest time. I made many bowls of chicken crumble mash, making them the right consistency for easy eating. BeeGee has taught me so much about myself. I had no idea I was even capable of this level of chicken handling. While the outcome has not been what we wanted, I would not take back one minute of that precious time I got to spend with my BeeGee. Even cleaning up her poops has been a joy. I’m feeling a bit lost without her. When she was a well chicken out in the flock, she loved all the treats but especially lactose free yoghurt and watermelon. She had gained a high position in the flock and was much loved by the other girls. She was never once mean to another chicken, even the Mean Girl Pekins who would have deserved it. She was a kind girl with loads of personality and a beautiful spirit. As I always post when this happens – there are 7 other chickens in the yard for whom life continues. They live minute by minute, sucking the most joy out of each and every moment, whether it is a dirt bath, finding a bug, eating a treat from the humans.. all we can do is love them while they’re here, protect them the best we can from predators, know when it is time to let them go, and remember them when they are gone. We will miss you, BeeGee. We loved our special moments with you. We will remember. Thank you for being such a great chook. Thank you for fighting so hard to stay with us, you very nearly won your fight, and you won our hearts along the way. Now you are safe, warm, free from pain and hanging out with our loved girls at Rainbow Bridge, where I am sure they serve endless plates of lactose free yoghurt. I agree totally with your words beginning “all we can do is love them while they’re here……. Thanks Cathy, she certainly knew we loved her. 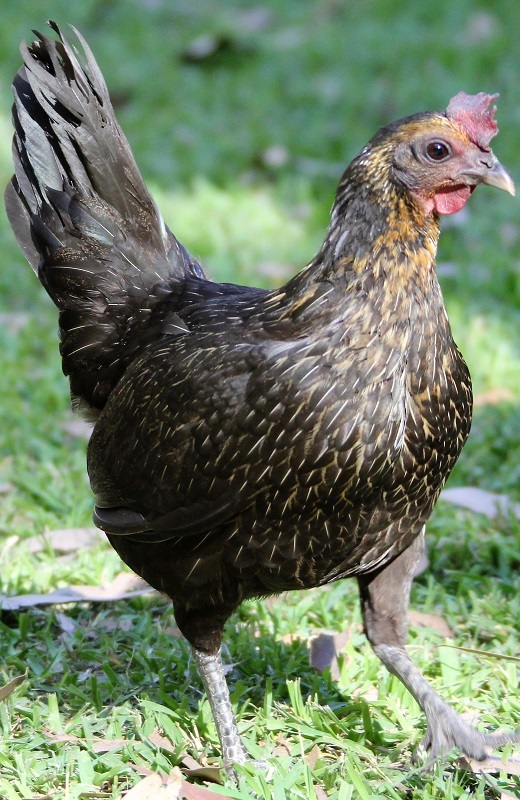 :) Such a beautiful chicken, and she was the only English Game Hen we had in that particular colour – we do have a Pekin with black and gold feathers. 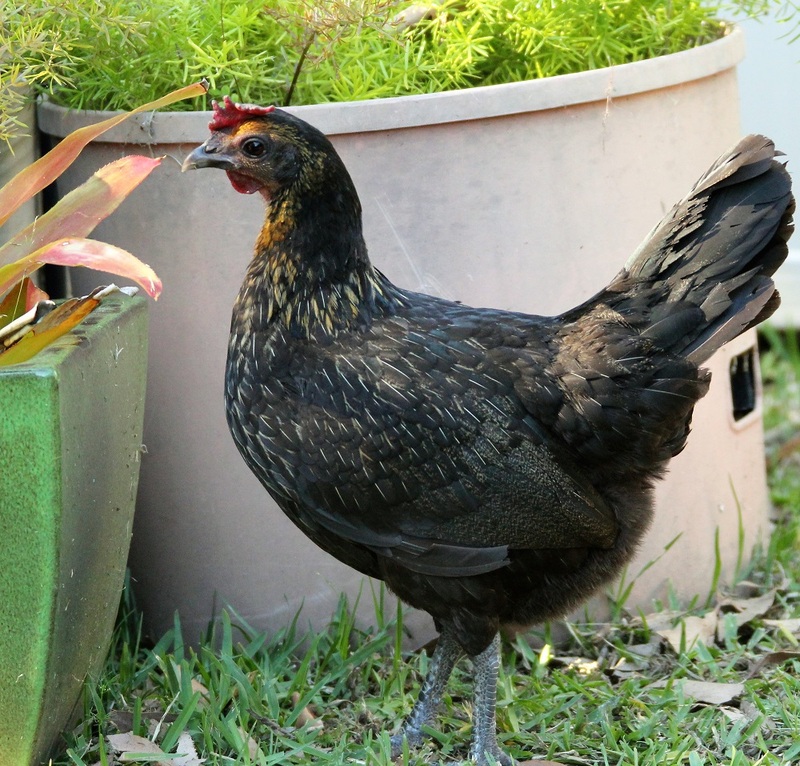 The photos here were from back in November before her summer moult, her feathers grew in even more beautifully. Not great news at all. Sorry. She did have a fine week or so at the end of her life. So, so sorry. She sure was loved and cared for. Thanks Mitchell. I’ve never done this kind of intense caring for a human or animal before and I found it pretty tough, but also very rewarding. Even though the outcome was not what we hoped for, I have a lot of happy memories of BeeGee. I’ll carry those with me and let go of the sadness of losing her, in time. I want to say a big thank you everyone for your lovely comments and the support you have shown during this difficult time. Yesterday we laid BeeGee to rest in the garden bed, tucking her head under her wing the way she would have liked. She had not been able to do that with her ear infection and balance issues. Oh no, I just came back to see how BeeGee was doing… I’m so sorry for your loss. She was a lovely girl. So very sorry to read this! As you said, you learned a lot about yourself through the depth of care and commitment you gave to BeeGee. 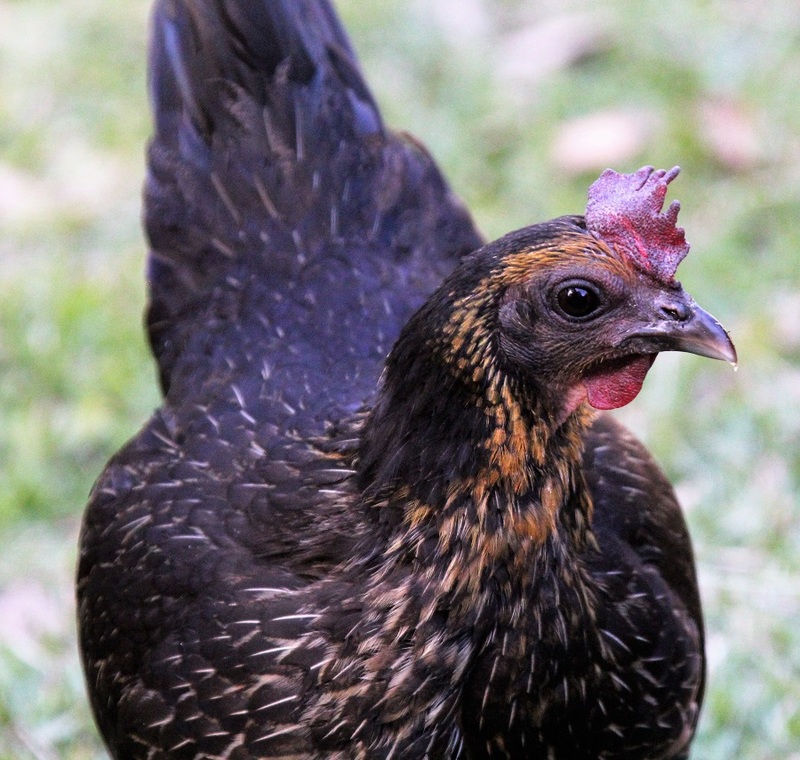 There was never such a well-loved chook. Sending hugs! You will have such good memories. What a beauty! I’m so sorry to hear this. You both fought so hard and it’s sad when you have to let go. She was clearly a much loved chook. May her seven sisters continue to thrive.